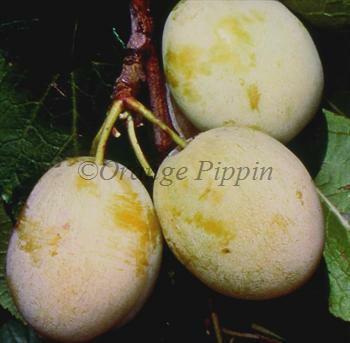 An attractive medium / large English yellow plum, grown commercially in the first half of the 20th century. Warwickshire Drooper has a pleasant flavour when ripe, but excels as a culinary plum. Please fill in the details below and we will let you know when Warwickshire Drooper plum trees are back in stock. Warwickshire Drooper is in flowering group 2. Warwickshire Drooper is self-fertile and does not need a pollination partner, although fruiting may be improved if there is a compatible tree of a different variety nearby. Warwickshire Drooper is easy to grow, and notably hardy. It produces a relatively large tree, with a spreading / drooping habit. Originates from Worcestershire / Gloucestershire, UK, early 20th century.